"Цеппелин-Штаакен" R-XIV и R-XV. Для дальнейшего повышения энерговооруженности своих машин фирма Штаакен в 1917 году вернулась к схеме пятимоторного самолета с носовой силовой установкой. Так появился R-XIV - самый крупный и тяжелый аэроплан эпохи Первой Мировой войны, настоящий шедевр тогдашнего авиастроения. Объем бензобаков был значительно увеличен, в результате чего почти на треть повысилась дальность полета. Кроме того, на R-XIV нарастили площадь вертикального оперения и ввели роговую компенсацию элеронов. До конца войны успели построить только 4 таких аппарата и 3 очень похожих на него R-XV. 5 из них принимали участие в боях на западном фронте. Экипаж, вооружение и оборудование R-XIV и R-XV такие же, как на R-VI. Development of the Staaken "Giants" continued in the R XIVs and R XVs of 1918, which, as far as can be ascertained, appeared not to differ. Three R XIVs were built, R 43/16-R 45/16, of which the first numbered machine was shot down by Capt. Yaille of 151 Squadron R.A.F. 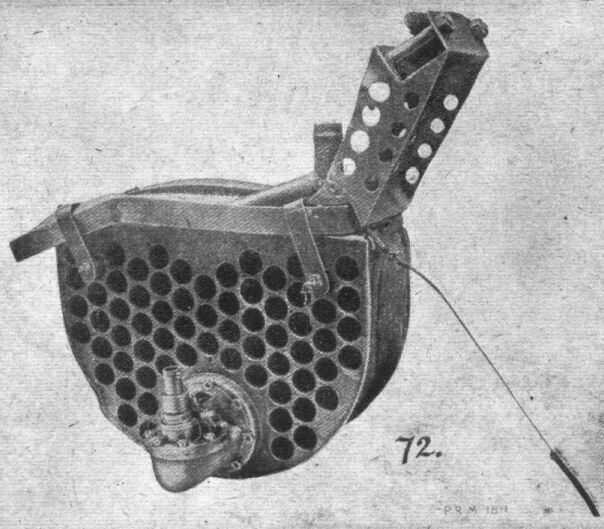 R 45/16 was used for experiments with control positions. The R XVs were serialled R 46/16-R 48/16, but were probably completed too late to see any service use. All machines were five-engined "Giants" and differed from previous aircraft in each engine having its own individual airscrew, making three tractors and two pushers, and in consequence the abandonment of gun positions in the nacelles. A large central fin was now included in the tail assembly in similar manner to the later R VIs. Engines, five 245 h.p. Maybach Mb IV. Span, 42.2m. (138 ft. 5 5/8 in.). Length, 22.5 m. (73 ft. 10 in.). Height, 6.3 m. (20 ft. 8 in.). Area, 334 sq.m. (3,607 sq.ft.). Weights: Empty, 10,350 kg. (22.770 lb.). Loaded, 14,450 kg. (31,790 lb.). Speed, 130 km.hr. (81.25 m.p.h.). Climb, 3,000 m. (9,840 ft.) in 70 min. Armament, five machine-guns. Early in 1918 the new Benz Bz VI developing 530 h.p. became available, and Aviatik were chosen to fit these engines to the basic Staaken R VI airframe. This was due partly to the parent firm being otherwise fully committed and partly to Aviatik's experience in the building of six R VI machines under licence. Three aircraft with the Benz engines were ordered, R 49 to R 51, designated Staaken R XVI (Av) and were the ultimate Staaken development. 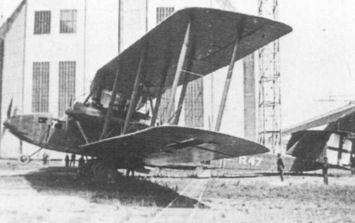 R 49 was completed in October 1918 but smashed its landing gear on a test flight and rebuilding cannot be confirmed. R 50 was finished after the war as a civil machine, but was soon dismantled. Although R 51 was well advanced in construction, it was never completed. Engines, two 220 h.p. Benz IVa and two 530 h.p. Benz VI driving tractor and pusher airscrews in two nacelles. Spinners were fitted, a refinement not seen on "Giants" built by the parent firm. Span, 42.2 m. (138 ft. 5 1/2 in.). Length, 22.5 m. (73 ft. 10 in.). Height, 6.5 m. (21 ft. 4 1/4 in.). Speed, 130 km.hr. (80.8 m.p.h.). Ceiling, 3,710 m. (12,172 ft.) in 76.5 min. In late 1917 the Staaken R.VI was followed by an improved, more powerful version, designated the Staaken R.XIV. These aircraft were powered by four 350 h.p. Austro-Daimler twelve cylinder engines, the most powerful available at the time. Unfortunately, the Austro-Daimler engine proved unreliable and the hope of developing a "super" R.VI series was shattered. 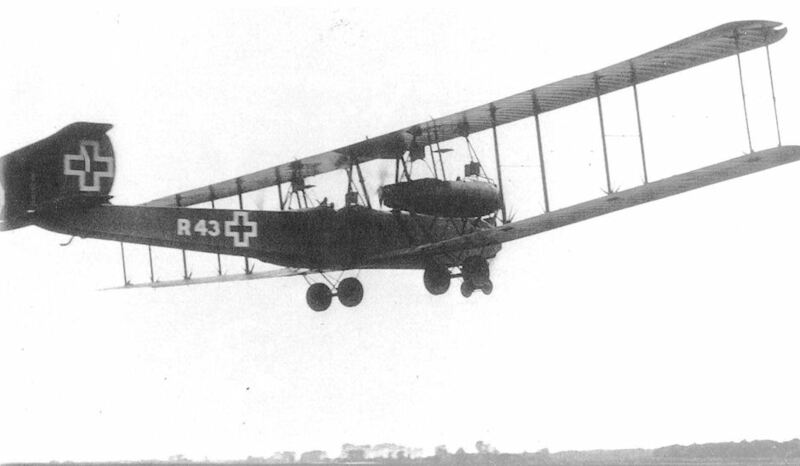 The R.43/17, first of the new R.XIV series, was almost complete in February 1918. 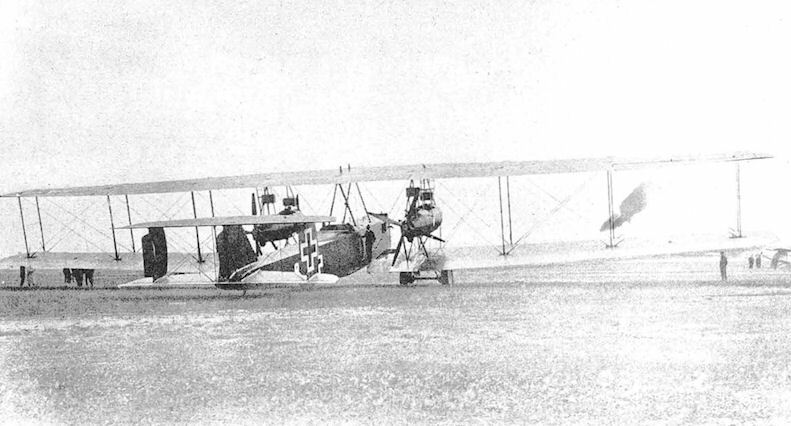 A March 1918 Idflieg status report stated that this aircraft had a new seating arrangement for the pilot, consisting of an open cockpit on the upper fuselage decking to provide a broad field of view. It also provided an unencumbered commander's bomb aiming position in the nose. The engines were installed without reduction gears in order to obtain full-scale performance comparison with geared propellers on other R-planes, and the engine mount was redesigned to eliminate the recurrent failure of engine support struts on the R.VI series. By March the R.43 had already flown many time. Its first flight in the acceptance programme took place on 11 April 1918, on which the R.43 carried a 4020 kg. useful load to 3100 metre altitude in 91 minute. Soon after taking-off on the next day a connecting-rod broke in one of the rear engines. The Austro-Daimlers were replaced by four 300 h.p. Basse & Selve BuS.IVa engines, and was reported once more ready for flight testing on 10 May 1918. However, the new unproven BuS.IVa engines showed a propensity for piston seizure and were in their turn removed from both the R.43 and the R.44 (which had been expected to make its first flight on 3 May 1918). The final installation consisted of five 245 h.p. high-compression Maybach Mb.IVa engines. Since the R.XIV weighed some 2000 kg. 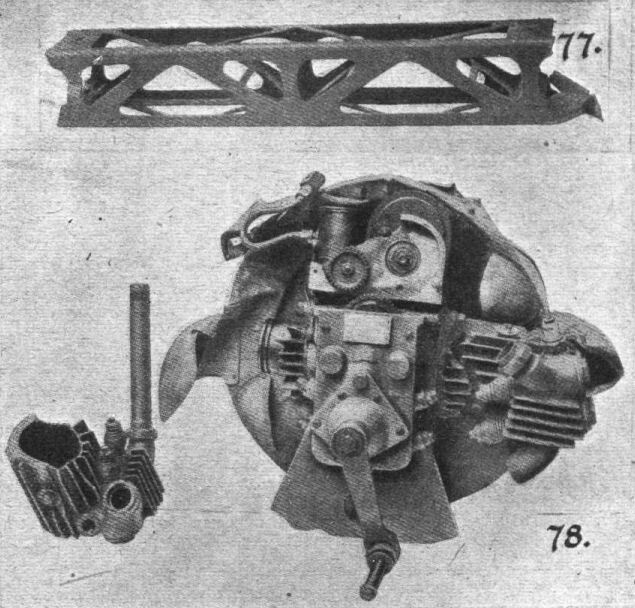 more than the R.VI, an additional engine mounted in the nose was necessary to at least keep performance on a par with the R.VI. It required some two months to modify the fuselage to mount the fifth engine. According to the record, the R.43 was ready for acceptance in July and the R.44 and R.45 were ready for their first flights on 3 July and 10 July 1918 respectively. The R.44 was delivered in August and the R.45 in July 1918. These two machines differed from the R.43 in that the nacelle tractor propellers were driven directly by the engine without benefit of the usual reduction gears. In his writings after the war, von Bentivegni, the experienced commander of Rfa 501, regretted the fact that no systematic attempt had been made to improve the performance of Staaken R-planes by carefully refining the R.VI series. Instead of concentrating on weight reduction and streamlining, newer machines such as the R.XIV embodied a purposeless increase of fuselage size, weight and drag, which in themselves taxed performance and to some extent nullified the effect of an additional engine. On the other hand, after comparing his experiences with both four- and five-engined Staaken R-planes, von Bentivegni was convinced that the disadvantages of the nose engine had been overemphasized and its advantages minimized. It should never be forgotten, he said in 1920, that an Staaken R.XIV 43/17 powered by five Maybach Mb.IVa engines, additional engine offered increased reliability, the most important factor in R-plane design. The problem of the high landing gear, which had been responsible for the elimination of the nose engine in the first place, was solved by simply keeping it short. This was made possible by design changes which allowed a normal "tail-down" ground attitude. Among the disadvantages discussed by von Bentivegni was the proximity of the fuselage engine to the main fuel tanks, a factor that increased the fire hazard in event of a crash. It was his opinion, however, that this danger was more than compensated for by the increased reliability provided by the additional engine. An unexpected problem discovered during operational service was that of unavoidable vibrations of the nose engine. These vibrations had a very deleterious effect on the more delicate instruments installed in the later Staaken machines, particularly on sensitive electric wiring and connections. According to von Bentivegni, the efficiency of the small-diameter ungeared propellers was hopelessly inadequate, and he considered this modification a total failure. Furthermore, the R.XIV series had strengthened airframes to house the more powerful Austro-Daimler engines. The resultant increase in weight was yet another factor which lowered the performance of these machines. Not until the last months of the war were R.XIV shortcomings eliminated with the advent of the improved R.XIVa series. The typical Staaken wing was retained on the R.XIV with exception of a 1•5 degree sweepback of the outer wing panels; a trailing edge cut-out above the propellers and the fitting of balanced ailerons which were neatly faired into the wingtip outline. Upper-wing gun positions were installed slightly outboard of the nacelles and between the nacelle struts rather than behind as in the R.VI. The nacelles, somewhat slimmer than those on the R.VI, were mounted higher in the wing gap, and the nacelle strut arrangement was considerably modified. The R.XIV machines were generally fitted with propeller spinners. The R.45 was at one time equipped with large-diameter four-bladed pusher propellers. whose blades were unusually narrow. The large spinner of the nose engine and the aluminium engine cowling provided a smooth entry to the fuselage, broken only by the protruding radiator and the auxiliary landing gear. As in the earlier Staaken giants, the flight engineer's compartment was located directly behind the nose. followed by the enclosed navigation and commander's cabin, which also contained the bomb-aiming apparatus that may have been hung externally during use. Then came the large open pilots' cockpit located in the upper decking. The open cockpit was a definite departure from the closed cockpit of the R.VI and demonstrated the crews' preference to fly in "open air" unhampered by window reflection, dazzle and condensation and the strange feeling of being shut in from the rushing air. By this time the Germans had tested and perfected a parachute that was being issued to service aircrews as it became available. The R.XIV carried a full complement of parachutes stored in external fuselage compartments with short "hook-up" lines running to each of the crew stations. The armament carried by the R.XIV consisted of six machine-guns distributed as follows: one each in the upper-wing gun positions and two each in the dorsal and ventral positions. The increase in the number of machine-gun over the R.VI, which generally carried four (sometimes five) guns, was a reflection of the intensified night-fighter activity of the Allies. A novel optical communication system developed by the Karl Bamberg firm was tested on the R.44. The technique consisted of writing a message on a frosted glass and then projecting the image through prisms and lenses on to an opaque remote-reading surface. The device worked well on the ground, but failed under vibration, which blurred the message to illegibility. 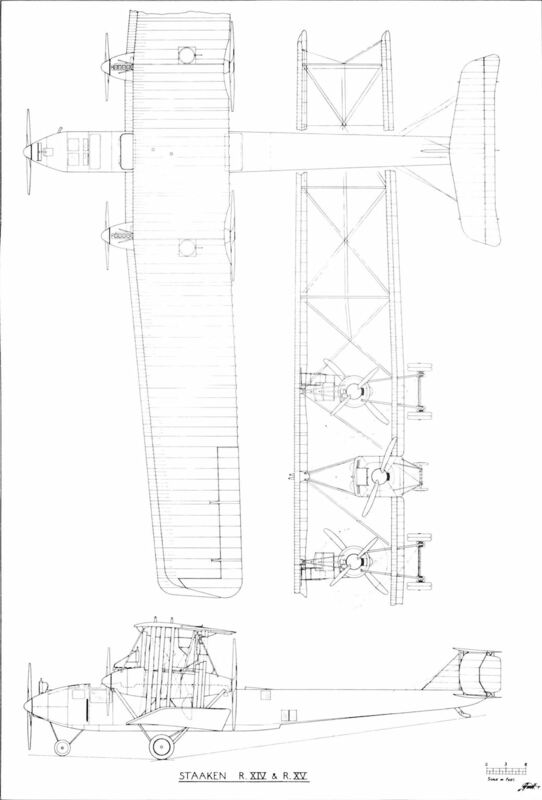 The R.45 was fitted with a cockpit located behind the trailing edge of the wings in a manner similar to the AEG R.I. The purpose of this configuration was to provide a better view of the undercarriage and ground while landing. During tests at Staaken the wing-root panels were left open in order to improve the downward view. By the time the R.45 left for the Front these panels had been covered and the narrow chord four-bladed propellers replaced by the more usual two-bladed propeller. On 9 August 1918 the R.45 left Staaken for Hanover, and on the next day continued to the Rfa 500 airfield at Morville. Lt. von Plotz and Lt. Steinhauser were the officers aboard R.45 when, accompanied by R.31, it took-off to bomb le Havre on 15 September 1918. After the raid, the R.45 received a wireless message warning it not to return to Morville because enemy aircraft were over the airfield and the landing lights would not be turned on. But the fuel supply was too low to continue on, forcing the commander to make the decision to land. The wireless operator notified the airfield and asked that ground personnel signal with flashlights. The first and second landing attempts failed, and it was not until a number of flares had been shot-off that enough illumination was provided to enable the pilots to touch down on the airfield. 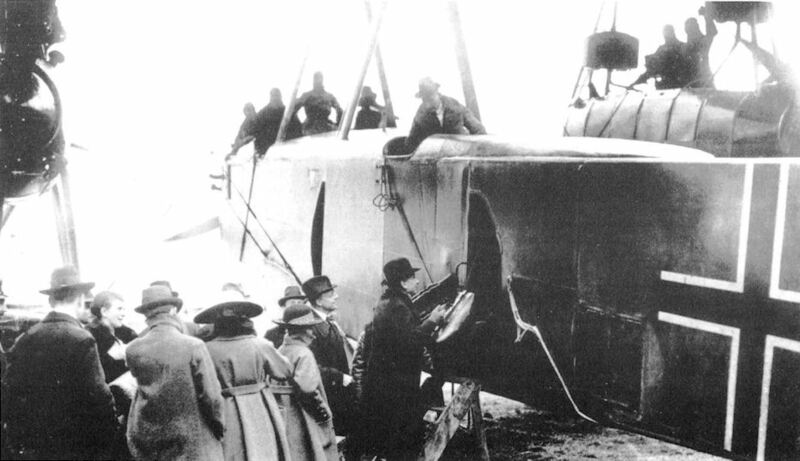 In spite of the emergency illumination, the R.45 missed the runway, which the crew noticed by the severe shaking they received. Suddenly, in the darkness, the left wing struck an obstruction, then the right wing and the R.45 stood still. In the morning the damage was inspected and it was found that the left wing had hit a water-tank wagon and a large portable ladder; the right wing some construction material and the roof of a peasant house. This fortunate accident saved the lives of sixty men who were sleeping in a barracks directly in the path of the careering bomber. It is doubtful if the R.45 was repaired in time to participate in further bombing raids before the Armistice. The R.43 and R.44 also saw service on the Western Front during the autumn of 1918. The R.43 has been remembered as one of two R-planes confirmed as shot down by an opposing aircraft. On the night of 10/11 August 1918 the R.43 of Rfa 501 was on a bombing mission when it was lit up by searchlights over Talmas. According to the records, it was an easy target due to the large amount of exhaust smoke. The heavy concentration of lights attracted four British pilots to the scene, one of whom was Capt. A. B. Yuille of 151 Squadron R.A.F. Recently transferred to France from Home Defence duties in England, 151 Squadron was a special nightfighter unit flying Sopwith Camels. The R.43 was attacked from all sides. Yuille closed to about 25 yards, but did not fire a shot until he had settled well below and behind the bomber's tail. Yuille then opened with three short bursts and put one engine out of action. The next two bursts set the fuselage afire around the rear gunner's cockpit. The R.43 started going down, with its nose down and turning on one side. It then dived more steeply, burst into flame and one set of wings dropped off. Yuille followed the burning mass down and watched it crash. The bomber's fall was seen for miles, even by pilots who were bombing is miles away and on the German side of the lines. Five of the crew attempted to bail out, but all seven crew members were killed. On hitting the ground, one of the bombs exploded, completely wrecking the fuselage. 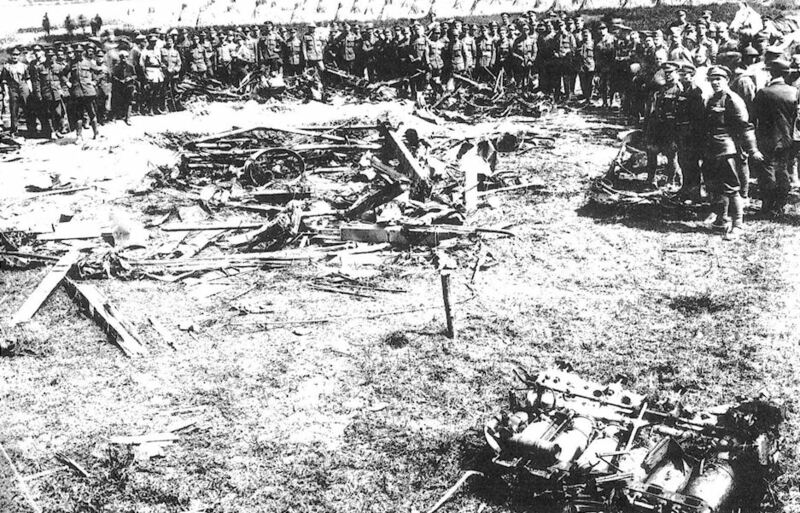 French and British aviation experts scrutinized the remains carefully, finding, surprisingly enough, two Lewis machine-guns (and also two Parabellum) in the wreckage. An interesting British Intelligence comment that "little regard was paid to saving weight in the design of fittings throughout the machine, some fittings being more than ordinarily heavy and cumbersome, even for such a large machine", supports von Bentivegni's comments as noted earlier. 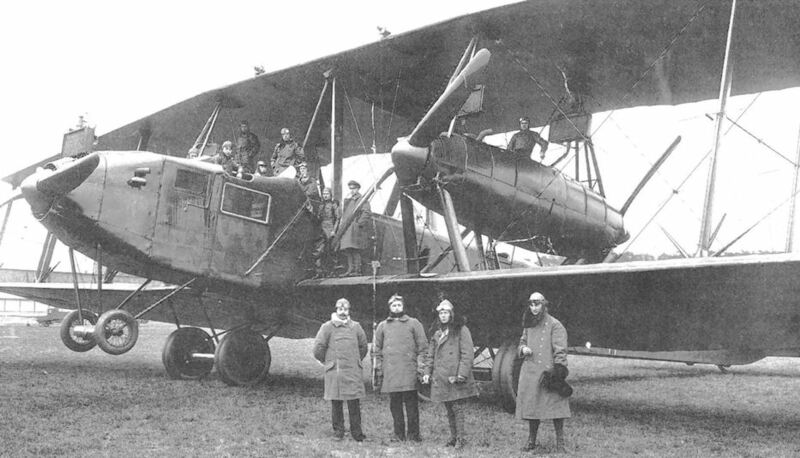 On 11 February 1919 British forces occupying the Rhineland found the R.44 abandoned on the airfield at Cologne. The machine had been stripped of fabric and engines, and only the gaunt skeleton remained. As a sideline to this history, it should be noted that just prior to the delivery of the last Zeppelin airship built at Staaken (the L.64), the name of the Zeppelin concern was changed again. On 25 January 1918 the Luftschiffbau Zeppelin G.m.b.H. and the Flugzeugwerft G.m.b.H. merged to become the Zeppelin-Werke G.m.b.H. Contemporary photos show cavernous airship hangars serving as construction and assembly areas for Staaken R-planes. The R.XIV machines were finished overall in printed camouflage fabric. The standard Latin cross was carried on wings, fuselage and tail. The serial numbers were painted in large white figures on the rear fuselage section. Climb with load, 3000 m. (9843 ft.) in 70 min. The Staaken R.XIVa serie comprised the last R-planes to be built by Staaken during the war. 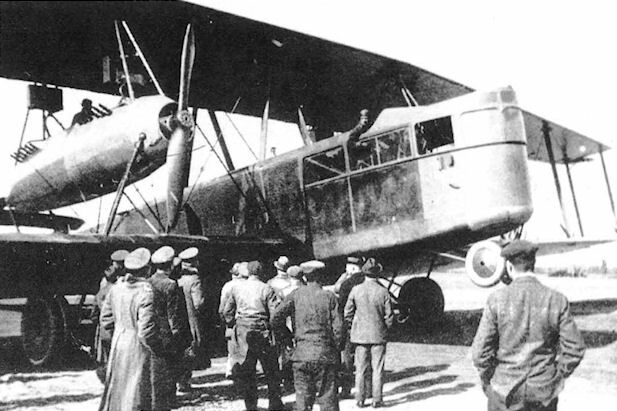 These aircraft were delivered later than the Staaken R.XV series. The R.XIVa, as the designation indicates, was an improved version of the R.XIV, modified to increase its rate of climb and operating ceiling with increased war load. To achieve this end, reduction gearing was again fitted to all engines and the weight of the machine was considerably reduced by internal structural changes and removal of upper-wing gun mounts and the bomb-bay fairing. The dimensions of the fuselage and nacelles were reduced, which resulted in a small increase of speed. The only other obvious change was that the elevator surfaces were balanced, making the R.XIVa the first Staaken machine to have all its control surfaces balanced. Idflieg ordered four R.XIVa machines from Staaken, and these received the serial number R.69 to R.72. Due to the production programme it was not possible to include all the modifications, particularly weight reduction, on the R.69; however, the R.70 was to be a fully lightened version. The R.69, delivered on 19 October 1918, did not see any front-line service. The R.70 and 71 were probably completed in late 1918 or early 1919, and it is not known if the R.72 was finished. 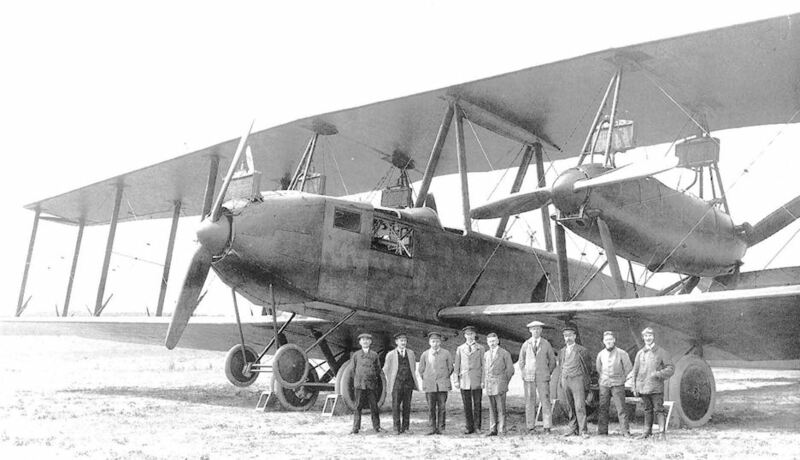 In 1919 the R.69 was chartered by the Ukrainian Government to fly money into the Ukraine, and was seized by the Inter-Allied Control Commission when it landed on a return flight at Aspern near Vienna. It was subsequently turned over to Italian authorities. The R.70 and R.71 were also flown between Germany and the Ukraine to deliver currency. 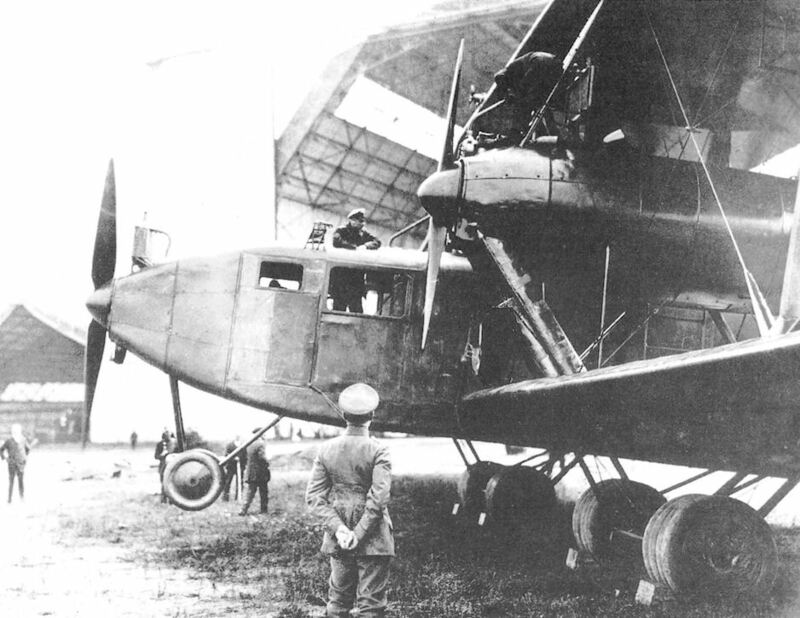 On 19 September 1919 the R.70 was confiscated by the Roumanian Government when it made a forced landing in Bessarabia. 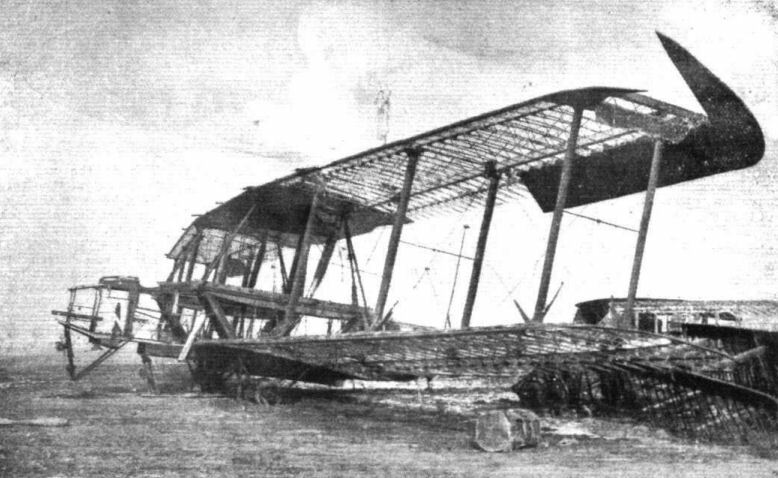 The R.71 crashed and burned of unknown causes in the forest of Ratibor during the summer of 1919. Schutte-Lanz was also given a contract to build three RXIVa machines numbered R.84 to R.86 at the cost of 600,000 marks each, but none were completed prior to the end of the war. Further details may be found in the Schutte-Lanz chapter. The R.XIVa machines were finished overall in printed camouflage fabric. The standard Latin cross was carried on wings, fuselage and tail. The serial numbers were painted in large white figures on the rear fuselage section. These machines continued to carry the Latin cross during their post-war operations. 1000 m. (3281 ft.) in 7 mins. 3000 m. (9843 ft.) in 45 mins. The Staaken R.XV series remain something of a mystery, for virtually no technical information exists to explain why these machines, though almost identical to the R.XIV type, received a different designation. The R.XV had the same engine configuration as the R.XIV and closely resembled the latter in outward appearance. It is probable that the R.XV was basically an R.XIV airframe modified to improve the performance by lightening the airframe. The airframe does show signs of greater attention to detail and streamlining; for instance, the nose cowling had more refined contours. If any other refinements were made they have not been recorded. There is no doubt, however, about the R.XV designation. The official German equipment tables for R-planes specified six machine-guns for this type. 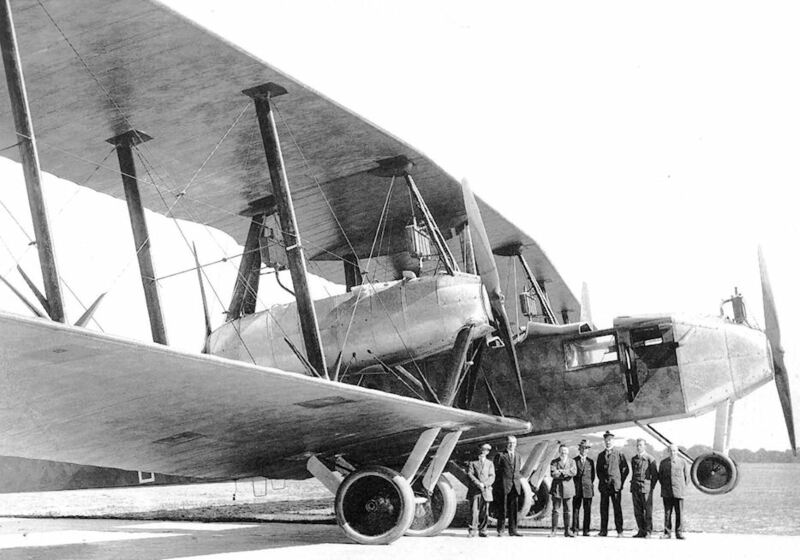 The R.46/17, the first of three R.XV machines completed, was reported as being ready for its maiden flight on 25 July 1918 and was delivered in August. A contemporary status report stated that the R.47 and R.48 were expected to be completed on 3 August and 13 August respectively: they were both accepted on 1 September 1918. At least two of these aircraft saw service with R-plane squadrons on the Western Front. 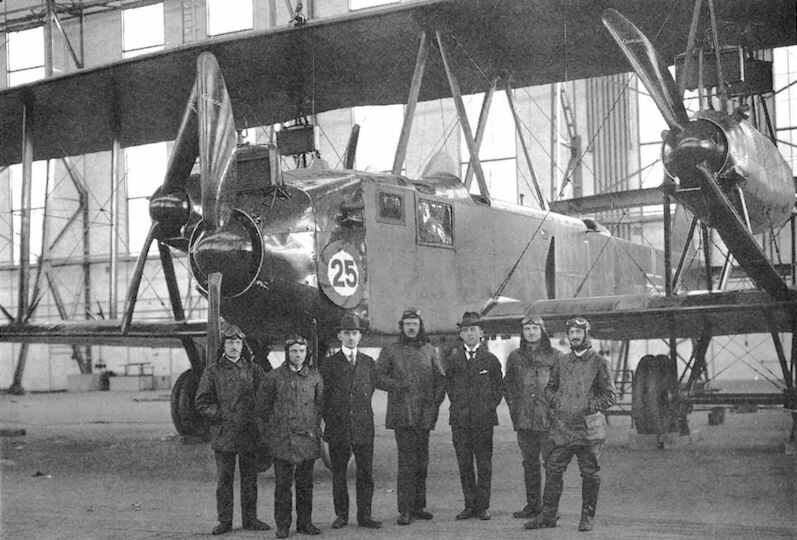 A victor's spoils, the complete R.47 was shipped to Japan, and the Inter-Allied Control Commission team that inspected the Staaken factory found the R.48 there in 1919. It may have been parts of this aircraft that were sent to the Isle of Grain for study. The R.XV machines were finished overall in printed camouflage fabric. The standard Latin cross was carried on wings, fuselage and tail. The serial numbers were painted in large white figures on the rear fuselage section. A FIVE-ENGINED bomber was brought down near Talmas on 10th, but unfortunately, owing to the explosion of one of its bombs, the machine was damaged beyond hope of reconstruction. 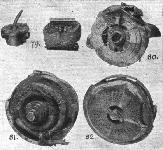 Some of its components have been recovered, and of these photographs are given in Figs. 67 to 82. The principal item of interest is the gear box, which is used for all five engines, each of which is a 300 h.p. Maybach of the standard 6-cylinder vertical type. The power plants are arranged as follows :- In the nose of the machine is one engine driving a tractor screw. On each side of the fuselage, supported by the wings, is a long pair of engine bearers carrying two engines apiece, which drive tractor and pusher screws in a manner exactly similar to that set forth in Fig. 46. 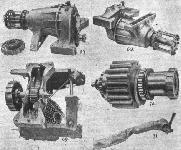 The use of the gear box and driving shafts necessitates the employment of a fly wheel on the engine, to which is added the female portion of a flexible coupling of the type already described. Whereas the gear box in the four-engined giant, of which notes have already been given in this report, is of a somewhat crude type employing external driving shafts between the gear box and the engine, in the five-engined machine the gear-box design is considerably improved. The casing consists, as shown in photograph No. 67, of a massive aluminium casting provided with four feet which are bolted to the engine bearers. Two kinds of gear boxes are employed. These differ only in over-all dimensions and the length of the propeller shaft. The larger type is used for the pusher screw in order to obviate the necessity of cutting a slice out of the trailing edge of the main planes. All the gear boxes were very badly damaged except that which is shown in Fig. 67. This is the longer type, but it would appear that the shorter design is very similar in appearance. In each case the gear reduction is 21-41. Plain spur pinions are used having a pitch of 22 mm. and a width across the teeth of 75 mm. The diameter of the smaller of the driving pinions is 162.5 mm., and that of the larger pinion 282 mm. The larger pinion is as shown in Fig. 73, considerably dished, but the web is not lightened by any perforations. Length, 1,025 mm. ; breadth, 675 mm. ; height, 535 mm. The driving pinion runs on two large diameter roller bearings, carried in gunmetal housings supported in the inner end of the gear box. This part is split vertically, and united by the usual transverse bolts, whilst the conical-shaped portion of the box is solid. The usual oil-thrower rings of helical type are fitted. At its outer end the pinion shaft terminates in a ring o serrations which engage with serrations provided in the male portion of the flexible coupling, these two parts being held together with bolts and clamping plates. The engine is thus close up against the gear box, in contradistinction to the design of the four-engine power plant. There is practically no external shaft at all. The larger pinion is mounted on a hollow shaft of 92 mm. diameter, carried on roller bearings at each end for radial load, and furnished at the nose end with ball thrust bearings. In the short type of gear box the larger pinion shaft is left solid, and it would appear that the gear box casing, instead of being made in three pieces, is made in two pieces, i.e., the whole box is simply split vertically. Reference to photograph No. 68 will show that the smaller pinion shaft projects right through the gear box, and at its outer end carries a projection fitted with a small ball thrust race. This projection acts as a drive for the oil pump, which is mounted on the oil radiator used in connection with each gear box. It is worthy of notice that the German designers have now fully realised the importance of using geared engines for weight carrying aeroplanes, and are apparently satisfied with the external gear-box principle, although in this case they have made it a very ponderous affair indeed. Needless to say, a great amount of the weight could have been saved, if 12-cylinder engines had been used instead of 6-cylinder. Gear box, long type, 280 lbs. Fly wheel and female clutch, 44 lbs. Oil radiator, 12 1/2 lbs. This, it will be seen, represents an additional weight of considerably more than 1 lb. per horse power. The oil radiator used in conjunction with each gear box is of a roughly semi-circular shape, and is slung underneath the main transverse members of the engine bearers so that it comes immediately beneath the large feet of the gear box, as shown in Fig. 69. This radiator is entirely of steel construction, and embraces 65 tubes of approximately 20 mrn, internal diameter. These are expanded and sweated into the end plates, to one of which is fitted a stout flange, against which is bolted a small gear pump which constantly circulates the oil from the gear box case through the radiator. This gear pump is driven by a flexible shaft from the small pinion, the shaft and its casing being in all respects similar to those employed for engine revolution counters. As shown in the photograph. Fig. 68, which illustrates the complete gear box upside down, this flexible drive is taken off a small worm gear. It will also be seen that underneath the oil sump of the gear box proper an electrical thermometer is fitted, which communicates with a dial on the dashboard. It is a little difficult to see what object can be served by this thermometer, unless it be to indicate the desirability of throttling down a little in the event of the oil getting unduly hot, as there is no apparent means of controlling the draught of air through the oil radiator. Fitted on each gear box and working in connection with the oil circulation is a filter of the type shown in Fig. 75. This is provided with an aluminium case and a detachable gauze cylinder through which the oil passes. The arrangement of the gear box is such that the axis of the propeller is raised about 220 mm. above that of the engine crankshaft. The construction of the long engine bearers is not without interest, as amongst other things, it indicates that German manufacturers are finding themselves short of suitable timber. Each bearer, as shown in Fig. 65, consists of a spruce or pine central portion, to which are applied, top and bottom, five laminations of ash. On each side are glued panels of three-ply, about 1 in. thick. The engine bearers taper sharply at each end, and are strengthened by massive steel girders under each gear box. One of these girders, which is a single-piece welded construction, is illustrated in the photograph, Fig. 77. The screws revolve at approximately half the speed of the engine, and having therefore a moderately light centrifugal load to carry, are made of a common wood that would scarcely be safe for direct driving screws. Although fitted to 300 h.p. Maybach engines, they are marked 260 p.s. (h.p.) Mercedes. The diameter is 4.30 meters and the pitch 3.30, for the pusher screw, but unfortunately, owing to the propellers being badly damaged, not only by the crash, but by fire, it is not possible to state whether the tractor screws are of the same dimensions and pitch. The construction is very interesting; each screw is made of 17 laminations of what appears to be soft pine, and these laminations are themselves in pieces, and do not run continuously from tip to tip. They are, of course, staggered, so that the joints in successive layers do not coincide. Two plies of very thin birch veneer are wrapped round the blades. The grain of this veneer runs across the blade instead of along it. It is difficult to say from the appearance of the screw whether this veneer has been put on in the form of two-ply or as two separate layers, one after the other. Among other details salved from the wreckage is the engine control. This is illustrated in photograph No. 76, and is a very massive affair. It consists of five stout steel tubular levers, two of which it will be noticed have become unbrazed in the fire which broke out when the machine crashed. The levers are fitted with ratchets so that each one can be operated individually, but the presence of the large-diameter toothed wheel in the centre of the lever shaft would seem to indicate that all five levers could, when desired, be controlled simultaneously. This fitting had, however, been very badly fused, and it is impossible to give details with certainty. A smaller fitting recovered from the wreckage is illustrated in photograph No. 71, and consists of a windmill of a type similar to that used on the D.H. 9 aeroplane. It is mounted at the top of an aluminium tube, but it is not possible to say for what purpose this mill is employed. A small and very heavy rotary pump, found in the wreckage is shown in photograph No. 71. This is possibly the hand-driven petrol pump, though it would appear unusually massive for this purpose. The Douglas type of engine, carried for the purpose of driving the dynamo of the wireless and heating installation, is illustrated in photographs No. 78, 80, 81 and 82, which show various views of the motor and generator. The engine is a very close copy of the 2 3/4 h.p. Douglas, and is made by Bosch. The fly wheel, as shown in photograph No. 80, is furnished with radial vanes which induce a draught through a sheet-iron casing, and direct it past cowls on to the cylinder heads and valve chests. The generator is direct-driven through the medium of a pack of flat leaf sprints, which act as dogs, and engage with the slots on the fly-wheel boss, as shown in Fig. 82. What appears to be a transformer, used in conjunction with the wireless set, is illustrated in photograph No. 79. The ponderous tail skid of this machine is illustrated in Fig. 66. It is built up of laminations of ash, and furnished with a heavy steel shoe and a large universal attachment. A complete and detailed report on the above-mentioned gear box, giving the fullest possible information and analysis of metals, etc., will shortly be published. Staaken R.XIV 43/17 in its original form with four Austro-Daimler engines arranged similarly to the R.VI. The Staaken R.XIV was an improved version of the R.VI, with four 350hp Austro-Daimler engines. R43/17, the first of the type, flew in February 1918 and the few operational aircraft saw active service in late summer 1918. 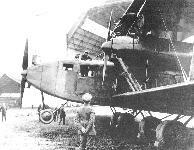 One aircraft, R43, was operating with RFa 501 on the night of 10/11 August when it was shot down. Staaken R.XIV 43/17 powered by five Maybach Mb.IVa engines. Staaken R.XIV 43/17 in flight. Staaken R.XIV 45/17 with the pilot's cockpit placed behind the wings. The German strategic bombing campaign against London continued into 1918. Zeppelin-Staaken RXV R47 was one of three of this variant to see operational service, the first, R46, having been delivered in August 1917. Staaken R.XIVa 69/18 with a visiting Argentine commission at Doberitz. Staaken R.XIVa 69/18 in the Ukraine. Staaken R.XIVa 70/18, chartered by the Ukrainian Government. Photo dated 14 June 1919. Staaken R.XIVa 70/18 on the Hundsfeld airfield near Breslau. Staaken R.XIVa (Schul) 84/18 prior to the fitting of propeller spinners. "Цеппелин-Штаакен" R-XIV, послевоенный снимок. На переднем плане - группа авиаконструкторов. The completed Staaken R.XIVa (Schul) 84/18. Staaken test pilots commemorating the completion of the 25th Staaken R-plane, an R.XIVa. Third from the right is Willy Mann who flew the first R-plane built by VGO. Staaken R XIVa (Schul). Example of decentralized power arrangement with five 245 h.p. Maybach Mb.IVa engines. Civilian passengers boarding a Staaken R.XIVa. Note the parachute shock cord running from the rear exit to the parachute compartment. Staaken R.XIV 45/17. Photograph shows the condition of the machine after a night landing at Morville, Belgium. Notice the position of the cockpit behind the wings, unique to the R.45 among Staaken R-planes. Some constructional details of the five-engined giant. - 67. 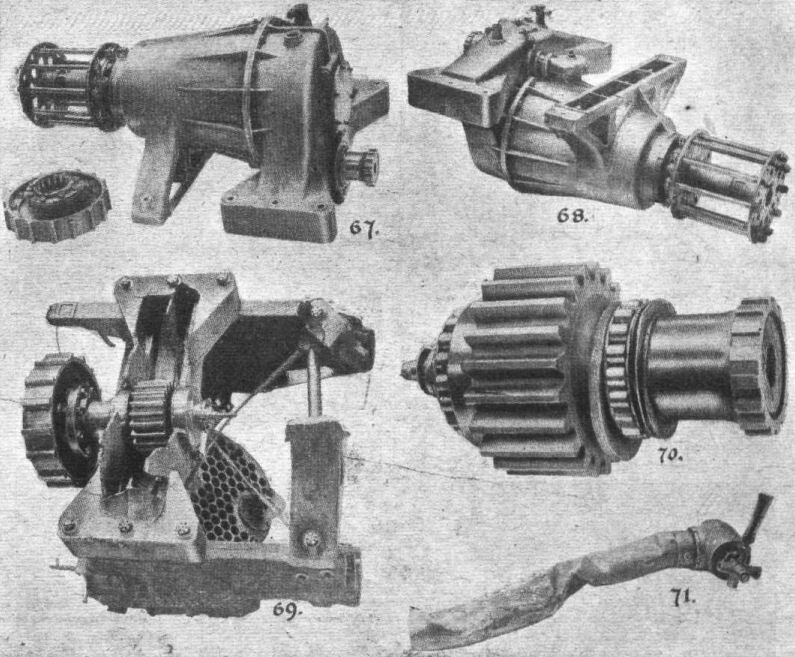 Long gear box, complete with male clutch. 68. Long gear box seen from underside. 69. Broken gear box (long type), with bearers and oil radiator. 70. Driving pinion. 71. Windmill. Fig. 72. - Oil radiator and gear pump of five-engined giant. Some more details of five-engined giant. - 73. Pusher screw and driven pinion. 74. Tractor screw and pinion. 75. Oil filter of gear box. 76. Engine control levers. Fig. 77. shows engine bearer transverse-girder. 78. "Douglas" type wireless and heating generator. The five-engined giant. - 79. Pump and transformer, 80. Rear view of engine and flywheel. 81. Wireless generator. 82. Cowling and dynamo drive. Wreckage of the Staaken R.44 on the Cologne airfield. February 1919. Derelict Staaken R.XIV 44/17 left behind by the Germans at their abandoned airfield in Cologne, 11 February 1919. The skeleton remains on a 5-engined Gotha at Cologne. Remains of the Staaken R.XlV 43/17, shot down by Capt. Yuille R.F.C. Fig. 65. - Engine bearers of five-engined bomber. Fig. 66. - Tail skid of five-engined type. Staaken R.XIV serial No. R.45. Experimental relocation of the control position.